As Image’s sci-fi ongoing series Descender reaches the end of its first arc, writer Jeff Lemire and artist Dustin Nguyen are dropping major plot reveals that will change the course of the title moving forward. (Descender will return in November, two months after the first collection hits stands.) 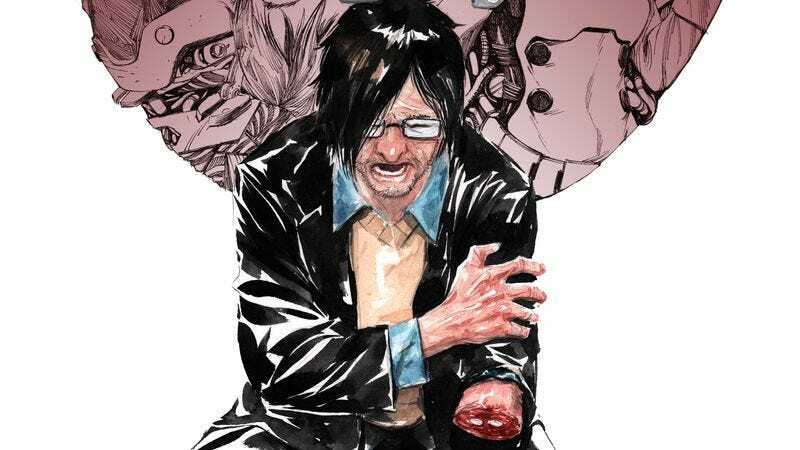 Dr. Jin Quon was previously believed to be the man who created the robots that rebelled against their owners and ignited an interplanetary war, but last month’s issue ended with Quon getting his hand cut off and confessing that he stole the technology. His backstory is a major part of this week’s Descender #6, which begins with a flashback to Quon’s days as an assistant to Dr. Dechang, and Quon’s past contains information that dramatically increases the threat level of the book’s robotic antagonists. This preview spotlights the immersive atmosphere and bold design that this creative team has brought to their story, making Descender one of Image’s top sci-fi comics (and there’s a lot of competition in that department). As captivating as Lemire’s script is, the most exciting thing about the series is Nguyen’s rich painted artwork, and after working at DC Comics for years, Nguyen gets the chance to let his imagination fly free on his first creator-owned title. The results have been stunning, whether he’s drawing quiet scenes in the desert or thrilling robo-action, and Lemire has crafted a narrative that allows his collaborator to keep pushing for new creative heights with each issue.